It has been a long weekend- lots of cake baking and ice cream making. That being said, yes, I waited until the very last moment to make these cookies. I wanted to use homemade granola because I think some other kinds can be too sweet and I like knowing what exactly is in my granola. Someone posted a link to an easy, basic granola recipe from Cooking Light, so I thought I would try it. I had some peach nectar sitting on the counter from a cake I made this weekend and instead of letting it go to waste, I decided it had to go into the granola somehow. I ended up doubling the granola, reducing the oil, adding peach nectar, wheat germ and flaxseed meal, but you aren't really here for the granola? Are you? Well, if you are, it was a hit. And it tasted great in these cookies. I think I am making more granola tomorrow. I still have a little peach nectar left in that can. Now, onto this little cookie. Or should I say, onto this large bar cookie. 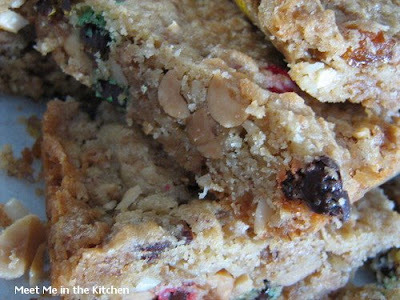 I used golden raisins, but only put half of them in and added mini m&m baking bits for the rest of the raisins. Everything else was pretty much as called for in the recipe, but I made it into bars. I just couldn't bring myself to make out all the little cookies today. And, I wanted to make sure they were chewy. I patted the cookie dough into a 9x13-inch pan that had a large piece of parchment fit into it- it was pretty thick, all pressed down in that pan. I reduced the oven temp to 350 and just keep an eye on em, I lost track of the exact time, but I knew when they looked done. It was probably around 35 or 40 minutes. They were perfect. Golden on top, chewy in the middle, and I got to cut them into large bars, which means we ate 1 and didn't have to feel bad, because we were full! I really liked this recipe and so did everyone else over here. 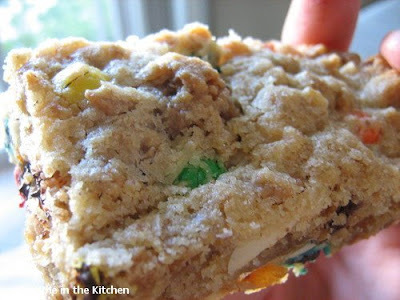 It seemed more like a trail mix cookie by the time I got done with it, but whatever you want to call it- It was good! Combine oats and all ingredients in a large bowl. Spread on a large jelly-roll pan coated with cooking spray. Bake at 300° for 1 hour, stirring every 15 minutes. Cool completely. Your version looks great! I love Cooking Light also! yum! and i like the bar idea...great job! I like your bar idea. I probably would have enjoyed these better as bars than cookies considering how mine turned out. I bet those bars were quite a bit chewier than my cookies were - nice change! Ooh, that granola sounds so good. I'm going to have to make a version with a little less oil. I can ususally make it lighter with OJ but didn't want to do it for the cookies. The bars look so yummy. I was just looking at your book list from your profile and I love all of your picks. Now I want to come and eat cookies and read novels together. Those bars look really delicious! I think I see M-n-M's in yours - I put some in mine as well! I love Cooking Light! Your cookies look delicious! I imagine the peaches made them really pop. Mmmm cookie bars. I'll have to try out that CL granola recipe! Thanks for posting it. Great job! 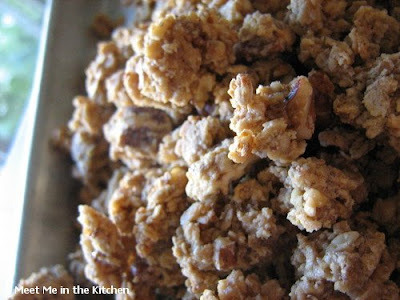 Oh man that maple-pecan homemade granola sounds SO GOOD! With peach nectar? Are you serious? Nice! Yum! I love bar cookies. These look amazing! Love the easy bar idea! And your peach cake is amazing! Mmmm, peach nectar... sound heavenly! Glad to hear they work as a bar cookies. They're so much easier than drop cookies. Great job!! I am loving the sound of your granola recipe - thanks for sharing! Your version looks fantastic. How can one go wrong with cookies and granola!? I saw that recipe for the ganola, too. It sounds so good, I think I'm going to try it! The cookies look great. I made bars, too. I thought that they were absolutely addictive. Oh my goodness, your bars turned out wonderful!!! I was sorely tempted to make bars with mine instead of cookies. Yours look great! Well done! Love the M&M's in them! Your granola sounds amazing! And I love the idea of baking them in bars! Wow - that granola sounds marvelous! Mmmmm. It all sounds yummy!